The route up Ingleborough starts from the railway station. If you arrive from the South by train, don’t cross the tracks; just use the gate at the southern end of the platform to access the path. Railway travellers from the North have to cross the tracks to access the path. Check both ways and keep your ears open. There is a national park pay-and-display car park in Horton, with toilets, and some on-street parking, but considerate use by residents is appreciated, otherwise they themselves have nowhere to park if the space outside their house is taken. Horton is a straggling village strung out along the main Settle to Ribblehead road, and the railway station is towards the northern end of the settlement, where the main road takes a 90 degree turn to the right at its junction with Cragg Hill Road. Walk straight on, up the hill and over the cattle grid into the station and use the gate on the left to access the platform. Check carefully for trains before using the crossing and exiting the station by the gate. The path climbs briefly up pasture land before heading right and crossing the access track to Beecroft Hall. Cross the track and head for the stile, and into open land. The path heads for a wall corner before another stile gives access to limestone pasture. The route heads up to the right before turning straight uphill to reach the bottom of Sulber Nick, firmly in limestone country. Follow the path as it rises gently through limestone outcrops before it reaches the footpath crossroads at Sulber, marked by a finger post. Carry straight on along the easy to follow path which eventually clears the limestone to emerge into moorland, with a tumbledown ruined shooting hut on the right. The path steepens as it flanks Simon Fell, with the head of Fell Beck, which will eventually tumble into Gaping Gill, to the right. 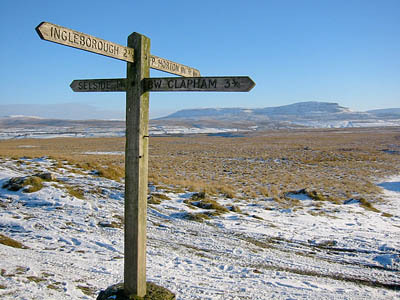 Further steepening leads to Swine Tail, the north-east shoulder spur of Ingleborough, where the path joins that ascending from Chapel-le-Dale. The path then heads upwards to the left, over a rocky section before emerging on to the summit plateau. In good visibility, the cross shelter should soon come into view towards the south western end of the plateau. In bad visibility, use the right-hand edge of the plateau as a handrail to guide you towards the shelter, but stay away from the very edge, as there are steep crags and walkers have been blown off by strong winds.